Vienas iš pačių patikimiausių maitinimo blokų savo klasėję. The CX650M is among the best bang for the buck PSUs available on the market today. 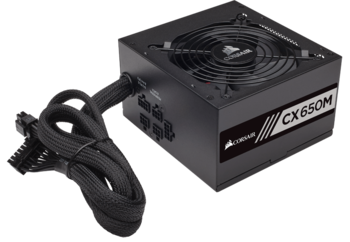 It offers very good performance and it is silent enough, although it could be even more silent with a lower, minimum fan speed. At its current price it is very difficult to find a better unit, covered by a hefty five-year warranty. Ilgi, juodai dengti kabeliais pasieks komponentus net TOWER tipo korpuse.